Globally, our sea of the chalk is situated in him W of the continent eurasiatique. This continent is an inheritance of the super-continent of Pangée which existed of the end of the Carboniferous period at the beginning of the Jurassic. At these times, the north wing of Pangée which includes Europe trains Laurasia, whereas the south wing includes Africa, Antarctica, Australia and India. Pangée splits up then: Laurasia parts from Africa, Eurasia parts from North America because of the opening of Atlantic Ocean. This opening is not synchronous, it propagates of the South northward. Grabens (ditches of collapse) forms in Europe with an Atlantic direction. In the lower Cretaceous opens Bay of Biscay. 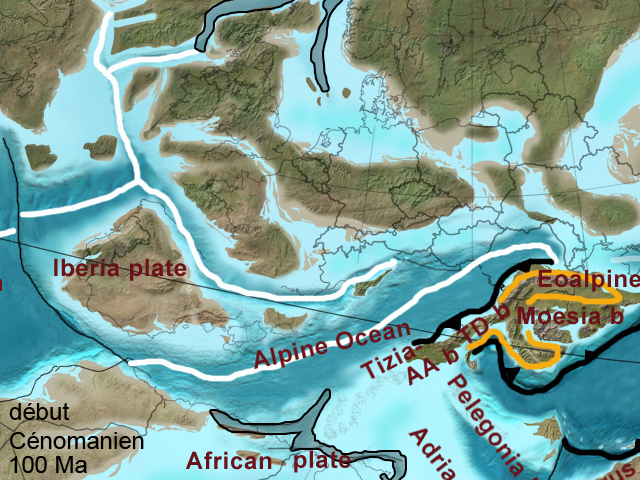 In the upper Cretaceous, in the Coniacien, before the magnetic anomaly C34, the pole of rotation between the European plate and the African plate modifies its position, which brings the convergence of these two patches, always current. In the continuation, Europe is going to register deformations which are going to be translated in particular by a tectonic inversion of the Mesozoic grabens (from tthe extension towards the compression). 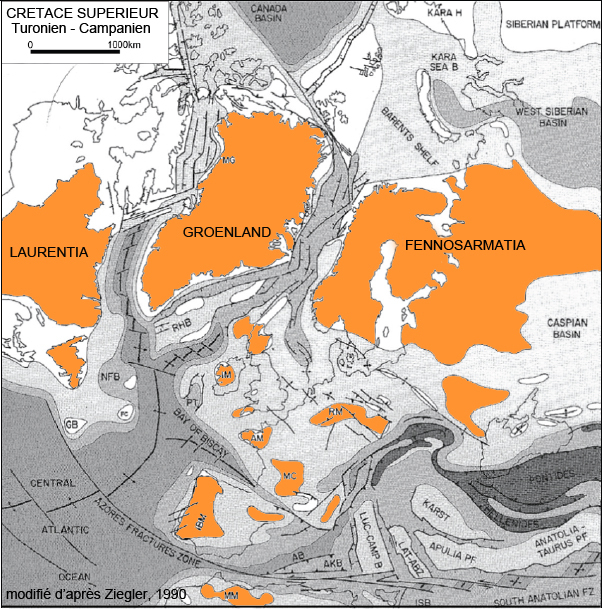 Tectonic card of north-western Europe (Ziegler, on 1990) showing zones affected by the tectonics subhercynienne. The previous card (modified according to Ziegler, on 1990) watch represented turns zones affected by the tectonics subhercynienne (upper Cretaceous). They are situated in Was born the axis of base London - Brabant. This tectonics subhercynienne takes place during the sedimentation of the chalk. The graben of the North Sea undergoes an inversion from the upper Cretaceous. 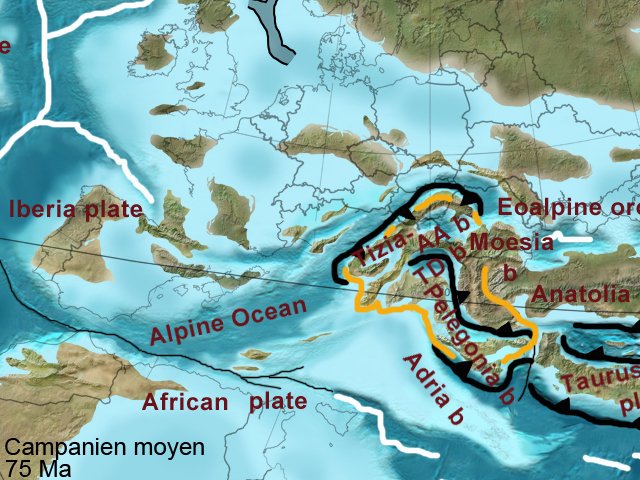 In the of Paris Basin, two orogènes begin to be set up in the upper Cretaceous, Pyrenees and the Alps. Tectonic card of Western Europe and northern Africa in Santonien (anomaly 34), extracts modified by Stampfli and al ., on 2002. 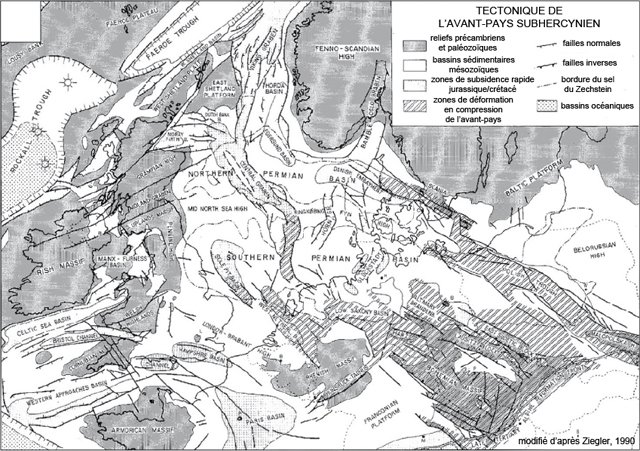 The tectonic evolution of Pyrenees is coupled with that of the opening of the Bay of Biscay. 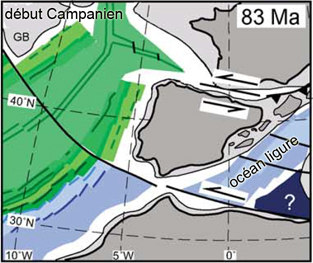 The first tracks of oceanic accretion in the latter date upper Albien, during the CNS (Cretaceous Normal Superchron). During the rifting, the Armorican Massif remains emerged, representing a retaining wall of rift valley. The magnetic anomalies allow to move forward that Aptien (1110 My) ) enters and Campanien (anomaly 33, 75 My), the Iberia moved about 200 km towards him. This movement places her then in approximately 100 km in S of its current position. The first travels compressifs, at the level of Pyrenees, will begin as soon as possible only in Maastrichtien (TThinon and al ., on 2001). The mega-units of Tisza and Dacia. The training of Pyrenees which begins in Santonien-Campanien. This phase affects at a distance the English-Parisian Pond. 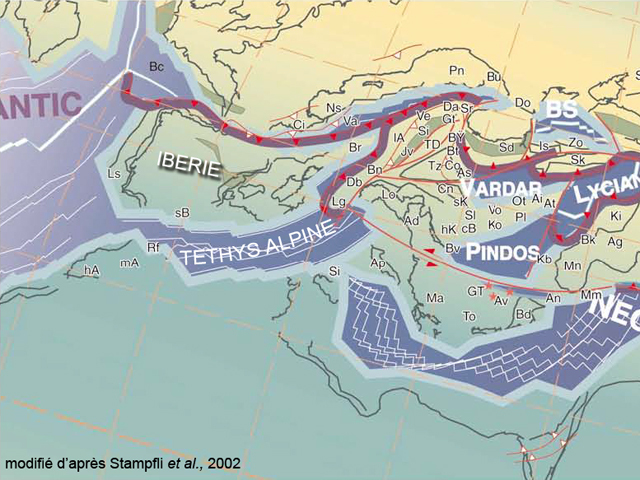 2 - A phase laramide (Paléogène = Paléocène with Oligocene), particularly in the limit Paléocène - Eocene between the magnetic anomalies C25-C24 (56 - 53 My) and the opening of the Mer de Norvège-Groënland. 3 - An oligo-Miocene phase, particularly between Chattien 25 My, an anomaly C7 and a Burdigalien 20 My, anomaly C6. During the last million years, the average speed of uprising is estimated at 55 / 60 m (5 5 in 6 m / 100 ka), on the basis of the section of the systems of terraces of the big valleys (Lautridou and al ., 1999a; Antoine and al ., on 2000). The various diets of constraints which acted on the chalk from the beginning of its deposit (Cénomanien) until our days were translated by phenomena among which the nature, the duration and the spatial area are very different. Earthquakes occurring during the sedimentation of the chalk and which affect especially coats most freshly put down (in-depth fragile break, slidings, slumpings, strains, resédimentation on-surface), qualified of séismites. Wrinklings (flexible deformations) which affect a set of coats of previously put down chalks. The seismic profiles demonstrate that number of these wrinklings is bound to the rejeu of former big weaknesses affecting the paléo-Mesozoic base, often with a horizontal rejection. Example 1: Mortimore (on 2010, fig. 38) represents a complex system of folds in level aligned in South Downs, on approximately 80 km in the WNW of Beachy Head. Weaknesses (breakable deformation) which affect even there a set of coats of previously put down chalks, but play over time during the deposit of chalky muds. The weakness of Fécamp-Lillebonne is one of these scenarios with abnormally thick average Coniacien, established by elementary sequences plurimétriques. Condensations or sedimentary thickenings accompany the tectonic deformation of the sea bed. At the level of axes anticlinaux, chalks noduleuses, hard-grounds and stratigraphical gaps are more pronounced. This effect is felt, for example, on the axis anticlinal of Bresle, with the development of hard-grounds Seas in upper Turonien. In Manche, recent earthquakes of weak amplitudes were listed by the networks of measure. They are replaced here on this Google card Maps (travel and zoom possible, click the icon to know the date). The most recent earthquake is the small earthquake of July 14th, 2011 between Havre and Isle of Wight. In XVIII Ème And XIX Ème Centuries, subjective indications (obviously no seismological network in this time) state earthquakes felt in the region of Fécamp in 1757, 1766, 1772, on 1833 et1881.